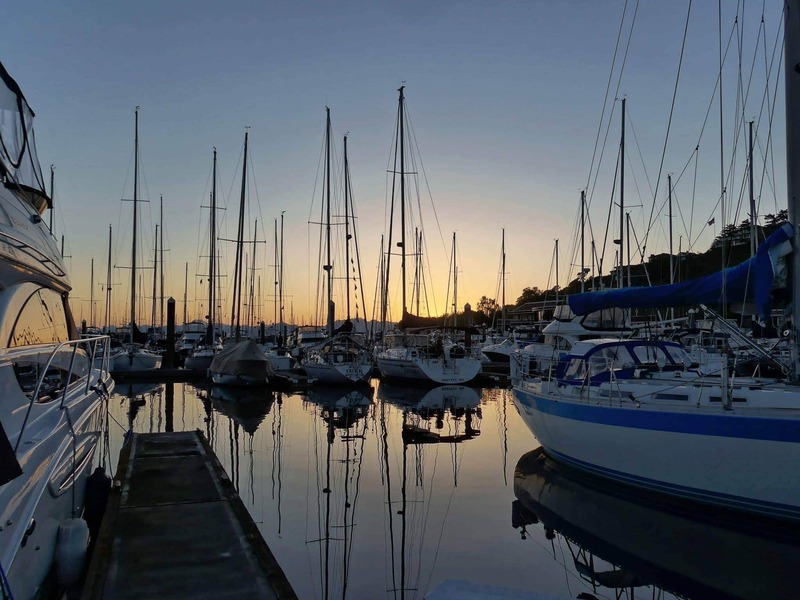 After our first trip of 2016 a week or so ago around Elliott Bay, it was time for an overnight to one of our favorite places, Winslow Wharf Marina on Bainbridge Island. We spent a lot of time there this last year, and love everything about it. This was also Grace’s first time out with the new Firefly battery bank which I will be writing about soon, and an additional set of tests and trials on everything else installed this winter. 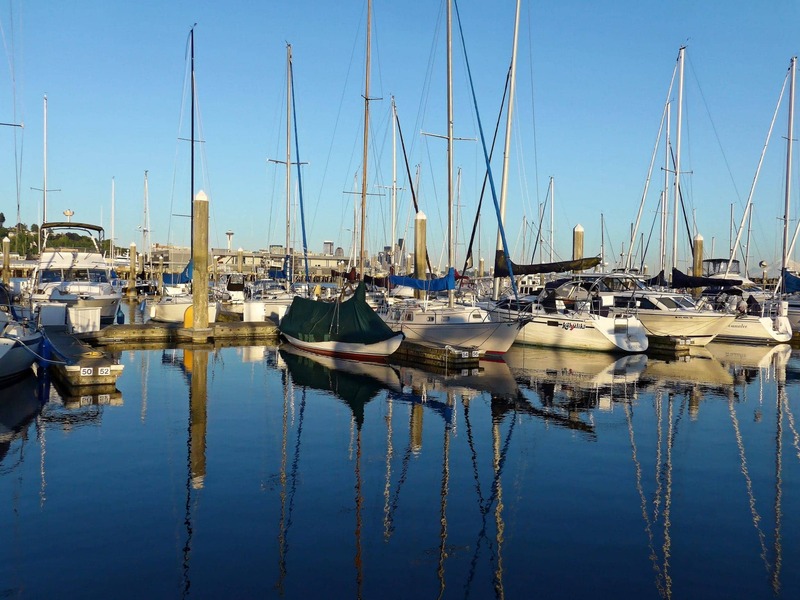 JJ and I departed Elliott Bay Marina around 11am on Saturday, looking forward to a relaxing sail to Winslow, only a few miles away. One thing that has been bothering me since Grace became part of our family last year is the mainsail. As you can see in this picture, the leech line appears to be twisted or overly tight. Just over a foot above the outhaul, there’s a jam cleat where the leech line ends, and there’s no spare line to let out. The upper portion and other areas are also equally tight, so I have yet to be able to figure out how to release the tension. I am woe to let the one end go for fear that it will get sucked up inside never to return. 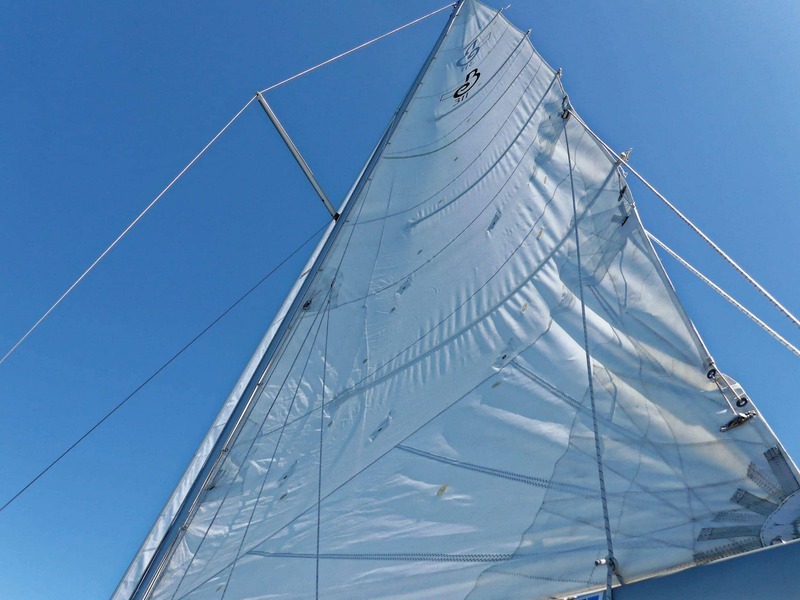 In addition to the leech problems, the sail in general never looks as balanced and full as I would like, and requires a lot more main sheet hauling than I’d like. 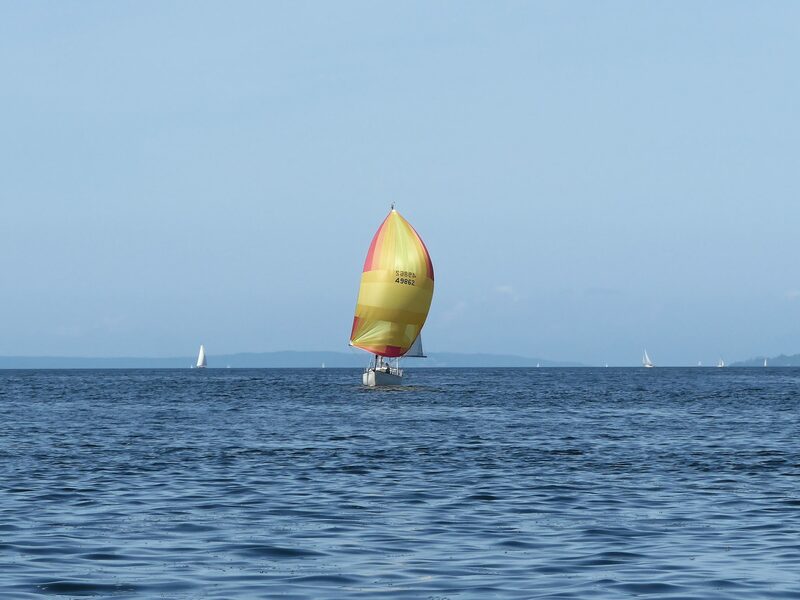 It seems that these mainsails are quite large based on the design by Beneteau, and in many cases people reef when the wind hits 20 kts, so I’m wondering if there are some additional tricks and tips I need to learn about the overall sail handling for the main. 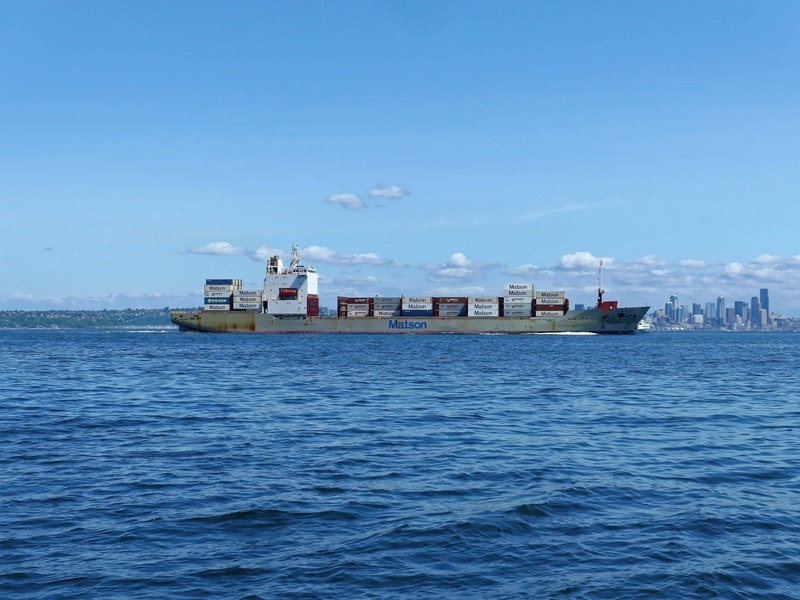 There was a decent amount of commercial traffic during our sail, including various cargo and container ships, as well as the usual ferries going to and from Coleman Dock to Bainbridge Island and Bremerton. 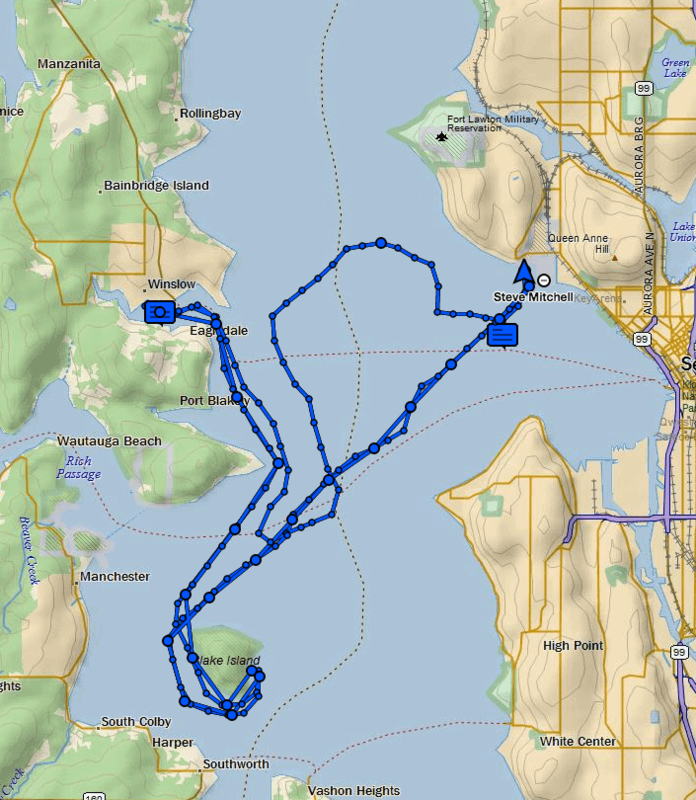 Saturday we spent most of our time sailing around up northward a bit, and then down near Blake Island. We did see a number of sailboats out on the water later in the day, including the beautiful one below. 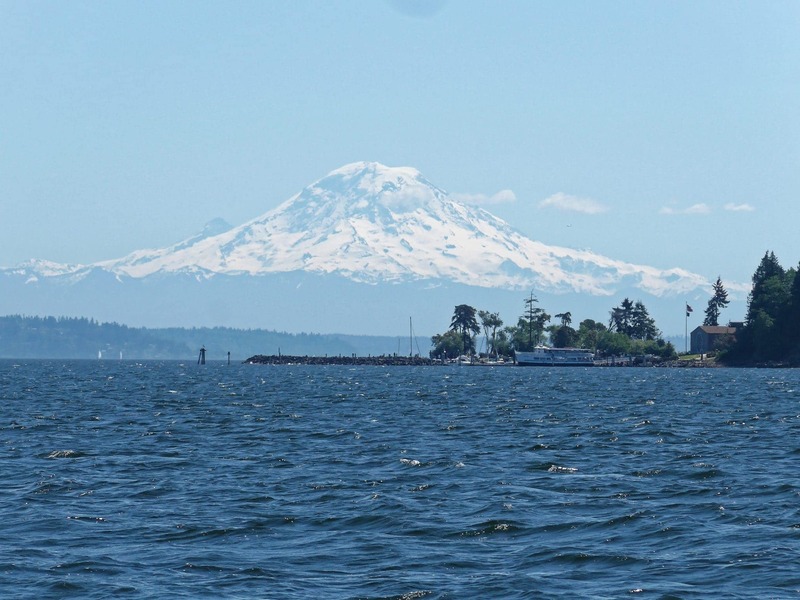 There was not much wind for the majority of the time we were on the water, until we decided to motor in to Eagle Harbor – of course right then it started blowing more! Eagle Harbor is Washington State Ferries maintenance facility, and there are usually a couple of ferries here being maintained. I’m a super huge ferry nerd, so imagine my delight at finding 6 different ferries in the harbor – the most I can remember ever seeing! In all, the Hiyu, Tillikum, Kaleetan, Evergreen State, Salish and Yakima were all here. 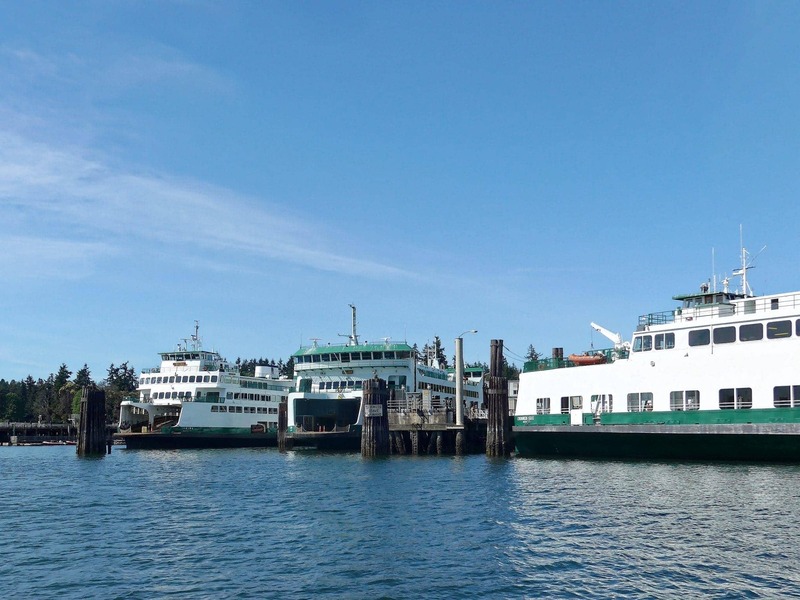 The Hiyu is a personal favorite, having spent much of my childhood on Vashon Island, and having fond memories of riding the tiny ferry between Pt. Defiance in Tacoma and Fauntleroy on Vashon Island. It’s the one in the picture above to the very right, a bit hard to see. 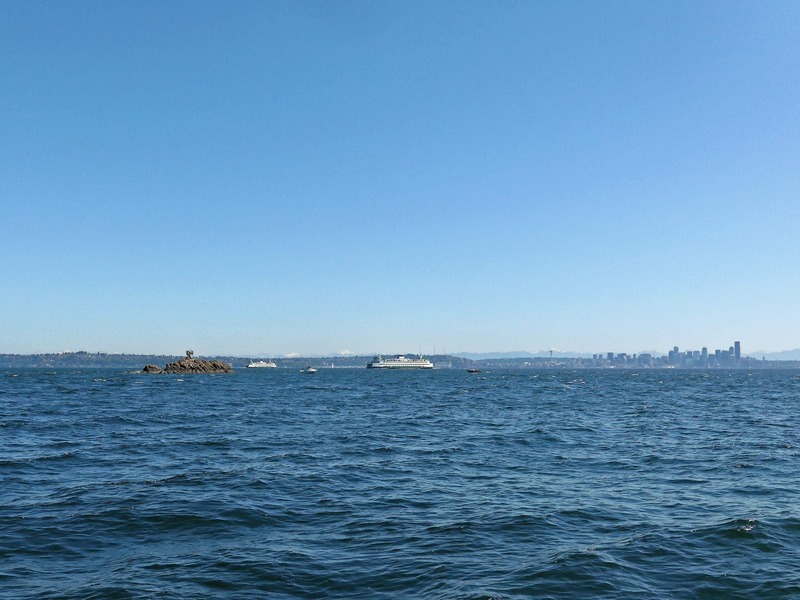 It was also pretty cool to see the Yakima and Kaleetan, both Super Class ferries, together in one spot. I witnessed the Yakima being towed away from Friday Harborwhile visiting back in March when it’s electrical panel went up in smoke. 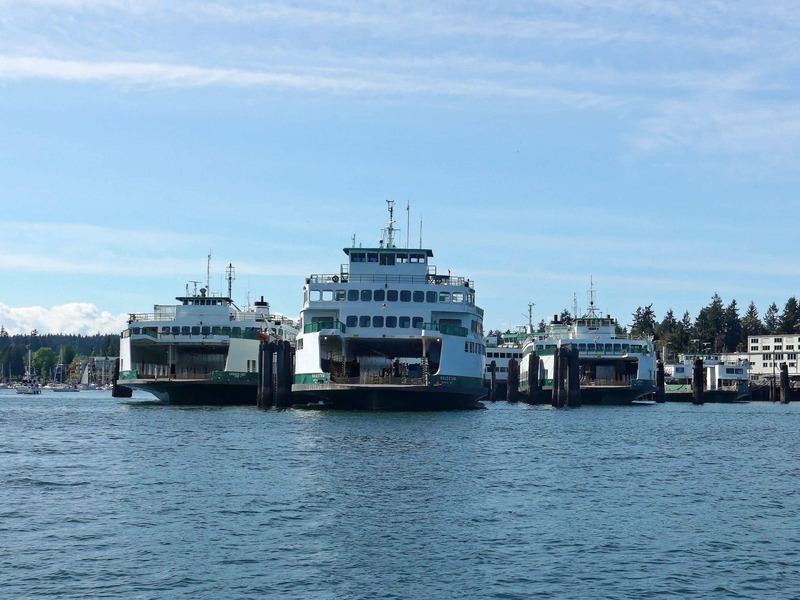 It was also a little sad to see the Evergreen State, which was the first in it’s class, now retired, with the Tillikum nearby, also likely to be retired in the next few years. If you want to learn more about the current and retired fleet, I highly recommendEvergreenFleet.com. The rest of the day we spent walking around town, eating a wonderful dinner at our favorite restaurant, Doc’s, and playing cards late into the evening in the cockpit. Sunday was even warmer and more beautiful than Saturday, and the wind was much more brisk as well. 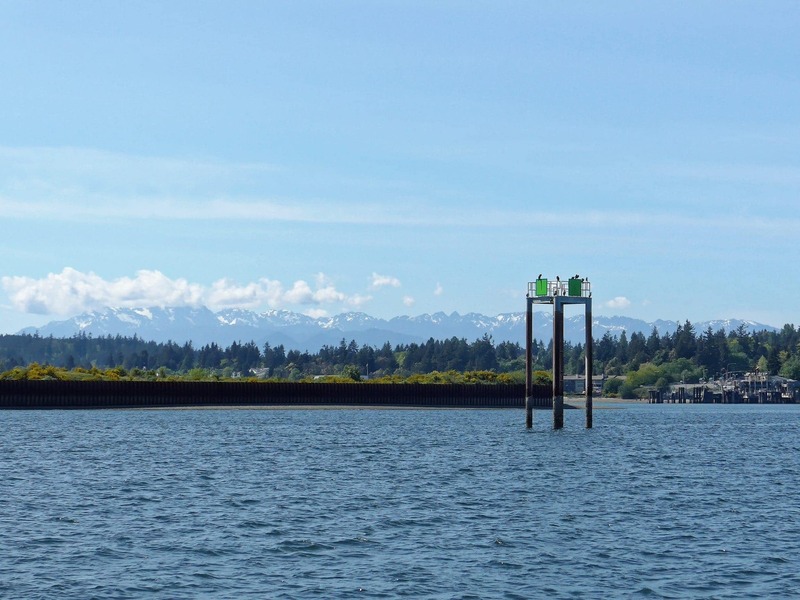 We were greeted by a couple of passing ferries as soon as we exited the channel out of the harbor, and headed down towards Blake Island. The views were stunning, as usual. The wind was now steady at about 16 kts and gusting to 20+ so we decided to motor around behind Blake to see if a mooring ball was available so we could take a nap and generally be lazy. Looks like we were not the only ones to have that idea, as they were all full. We circumnavigated the entire island, and found one on the south side of the marina spit but lost our boat hook trying to grab it! Already being tired from a long day before, we decided to motor back to Elliott Bay. JJ went below for a nap, while I used the auto routing feature on the Raymarine to get us home. I had been using this most of the weekend with pretty good success. The trip across the channel was pretty lumpy – more so than I expected. Wind was steady at 20 kts gusting to 25, and the waves were stacking up as they usually do between Alki Point and Bainbridge due to the fetch from the north. Everything got a nice coating of salt water, and it was pretty fun! 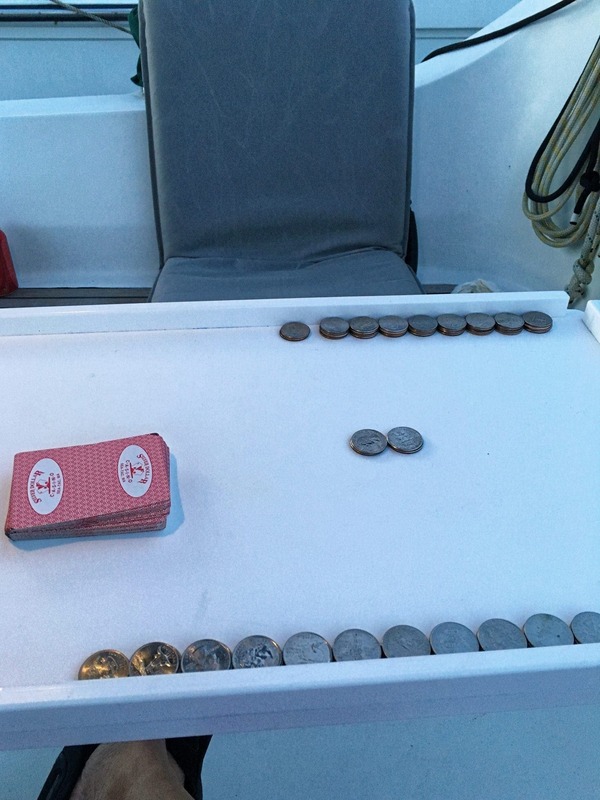 After docking, we enjoyed an evening of almost completely calm water and relaxing views. By 9PM everything had been wrapped up and we enjoyed a fantastic sunset. All of Grace’s systems worked as expected, with only a few new tweaks – and a new boat hook – needed prior to longer trips coming up. It’s great to be able to take short trips to Eagle Harbor without tons of extra voyage planning, and just enjoying the sail. I’m sure we will do more of these this year, but we’re also planning some much longer trips as well!